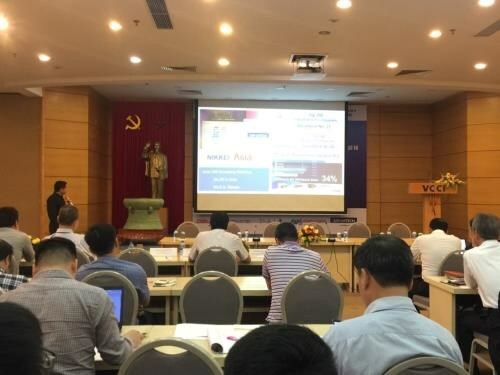 Hanoi (VNA) – A seminar on the application of the Internet of Things (IoT) in the operation of small- and medium-sized enterprises (SMEs) was held in Hanoi on April 11. The event drew experts in economy, science and technology, and nearly 100 businesspeople active in various fields. It is part of a project to enhance competitiveness for businesses through innovation and technological reform in the context of the Fourth Industrial Revolution (Industry 4.0) implemented by the Vietnam Chamber of Commerce and Industry (VCCI). Vice Chairman of the VCCI Hoang Quang Phong said the workshop aims to help the Vietnamese business community realise the potential of the IoT and its application in reality. It also opens up opportunities for businesses to access information technology to optimise their operation and improve working efficiency to increase revenues and profits, he added. Participants were introduced with IoT projects in agriculture, environmental monitoring, smart cities, and smart production.